Well, with everything that has been going on lately, we didn't do all that much for Chiquita's birthday, but we still had a wonderful day. Chiquita requested a Dora cake... She has never watched "Dora" (maybe an episode or two while traveling) but she has always been told that she kinda looks like Dora and has a few Dora dolls... No mater how I tried, after looking at a number of Dora cakes online trying to find one I might be able to make, I couldn't talk her out of it... Anyhow, I didn't want the cake to be just Dora, so I found a cute little Dora candle to add to a cake of my choice! ;) She loved it! In the morning, while playing outside, Chiquita fell and skinned up her knee pretty good... So, for the rest of the morning and early afternoon, she refused to walk. We spent lots of time reading books on the front porch which was nice and peaceful! By late afternoon, she hesitantly started walking again and was soon running around outside! Before daddy left for work, she opened one of her gifts, a little Dora playhouse, which we set up on the grass. After dinner my mom and three of my three youngest brothers came over for cake. 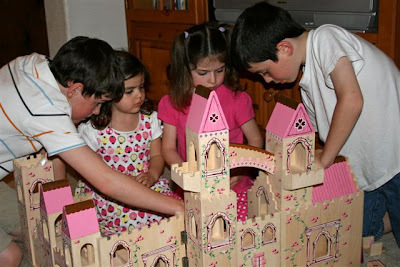 As for birthday gifts, Chiquita really wanted a "little dollhouse" to go with the Castle they received for Christmas, but (since I didn't have a chance to paint it decided to save it for Christmas) she was thrilled with the Slice and Bake Cookie Set and Princess Castle Furniture she received. The girls have been playing with them every chance they get! I still can't believe she is already four! She is growing up so fast!! She's getting so big!!! Can you believe how fast they grow? i love that cake too! i might have to borrow that idea for a june bday i have coming up. My Angelica loves Dora as well, love the cake. Angel has requested a butterfly cake for her upcoming birthday so trying to figure that one out! New at these birthday cake decorating ideas!! Is that a Melissa and Doug castle? Looks like so much fun!!! Yes, it is a Melissa & Doug Castle. I really do LOVE it and so do the girls!